For those of you who read my blog on a regular basis, you will know that I've not been the happiest of photographers recently. Despite being the very proud owner of a new Nikon D850, I've not been having much luck with the weather recently. This has played havoc with my creative adventures! 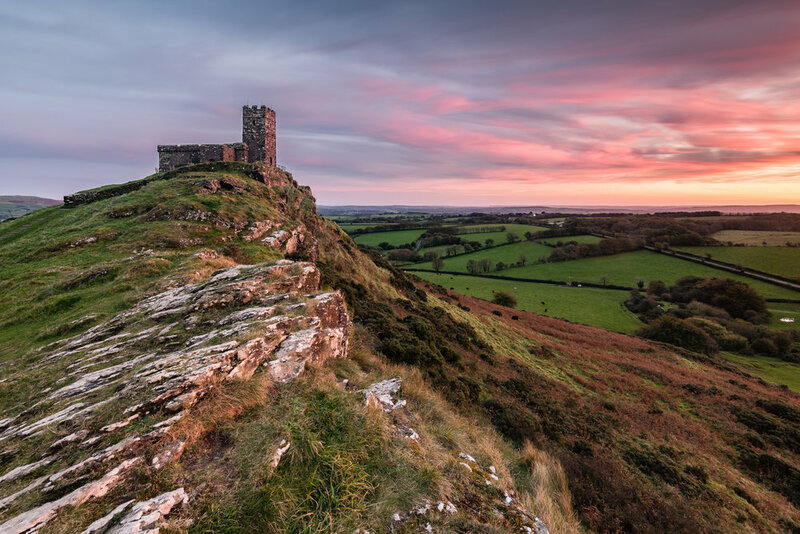 However, this all changed a couple of weeks ago when I visited Brentor Church and I was treated to an epic sunset. The night before I visited Brentor Church on Dartmoor, I also visited another Dartmoor location, Honeybag Tor. It was one of those evenings where you think your photographic mojo has completely deserted you. I found myself mumbling "why do I even bother" as I wandered back to the car. I'm not one to stay down for too long though. The very next morning, armed with a cup of coffee I got back on the computer and started checking the weather forecast for that evening. Best thing to do when you've had a bad trip out with the camera is get back out there and try again. After all, I have talked about the value of practice and perseverance before on this blog. So I took on my own advice and got to planning a trip out with the camera. I looked at the weather forecast, and even though it was forecast for nearly 80% cloud coverage, thanks to yr.no (a Norwegian weather service), I could see that most of that cloud would be high up. With virtually no lower cloud cover there would be a chance that just around sunset the golden light of the sun would illuminate the underside of that higher cloud. After a recent visit to Brentor Church, I was keen to revisit this Dartmoor location. So with a good weather forecast, and a wonderful location picked, I set off with a positive, but cautious frame of mind. I normally like to share the details of where I've taken a photograph, so I normally try and include a map. While adding the map for Brentor Church below I noticed a couple of things. The map above refers to Brent Tor, Brentnor, and St Michael's Church. So what is this location called? Well I did a little checking and to give the church its full name it's called The Church of St. Michael de Rupe (St. Michael of the Rock), which is located on Brent Tor, near the villages of Brentor, South Brentor, and North Brentor. I believe the church is commonly known as Brentor Church. So looking at the Google Map above I can only assume that some of those location spots are user submitted and contain minor errors. Anyway, now we all know what it should be called and how to spell it! My plan for Brentor Church was not only to take photographs but to also shoot one of my 5 Minute Photography Adventure videos. However, as I was visiting the location on a Friday evening and the weather forecast was good, I knew there would be a good chance there would be other photographers there. The problem with that is that I just can't seem to present to the camera when someone else is watching! I'm just too self-conscious! As suspected though, when I arrived, there were already a few photographers there. I told myself to just get on with it and get filming. But I didn't. To be honest, it was nice to keep the video gear in the bag and just chat to some fellow photographers. One of the photographers was from Wales and the other was a local photographer called Lee Smith (check out his work here). Both chaps were excellent company and we got to enjoy a very special sunset together. Brentor Church, like many locations, benefits greatly from good light. The ideal conditions would be to have a dramatic sky, and the side of the hill and church illuminated by some nice side lighting from a setting sun. The image below gives you a hint of what that might look like. Nikon D850, Nikkor 16-35mm f/4 @ 18mm, ISO 100, 0.6 sec @ f/13, Lee Filters circular polariser and ND grad. On the night that I was there, that side lighting didn't last too long. Unfortunately, the sunset behind some distant low cloud. However, in the next photo, you can just about see the sky and clouds starting to change colour. Nikon D850, Nikkor 16-35mm f/4 @ 22mm, ISO 64, 210 sec @ f/13, Lee Filters circular polariser, Little Stopper and ND grad. And then, just as the sunset, the sky lit up in spectacular fashion! All of a sudden the sky was full of pinks and blues. This allowed me to capture my favourite image of the night. Nikon D850, Nikkor 16-35mm f/4 @ 18mm, ISO 100, 5 sec @ f/13, Lee Filters circular polariser and ND grad. The amazing sky can't have lasted much more than 5 minutes and you can see from the following two photographs how quickly the sky can change in a few minutes. I was glad I was up there early and had everything set up and ready to shoot before the action started. It was a wonderful evening of photography. Not only did I get some images that I was very happy with but I had a great time chatting with some fellow photographers. I will get that video of Brentor Church done one day. Not that I need an excuse to visit this great location again. So have you shot Brentor Church before? What was the best sunset you've photographed? Let me know in the comments below.